Homer Alaska is the halibut fishing capital of the world. Not only can they grow to in excess of 400 lbs, but Halibut can also put up an epic fight. Homer, Alaska, fishing will be on anchor using the tide or drifting looking for trophy halibut. We prefer fishing shallow water using light weights depending on tide, weather, and time of year. The fish you wish to keep, is the fish you take home. I mark the tail of each fish so you can distinguish your fish from the others and take home your catch. Every fish is treated as a trophy, because it could be the first fish you ever caught to the trophy you have been waiting for. It is not uncommon to catch rockfish, lingcod, salmon, or shark during the trip. We consider these bonus fish and its just part of the experience. It would be a great time to enter the world famous Homer halibut jackpot derby, because you never know what you will catch. Halibut charters start at $250 per person click on our charter packages booking tab for more info. Salmon fishing is done by trolling with the use of down riggers, waiting for the salmon to strike with a fish on! The largest king (chinook) salmon are typically caught during the months of May and June but kings may be caught year round. From July to September we also target silver (coho) salmon the best pound for pound fighting fish in Alaska. Kachemack Bay offers 5 different species of pacific salmon which consist of king, silver, sockeye, pink and chum during the summer months. With so much action and variety we have the ability to put together different combinations of salmon. Each species has its own possession limits to make up a combination of 6 salmon in possession per person. Salmon charters start at $250 per person click on our charter packages booking tab for more info. 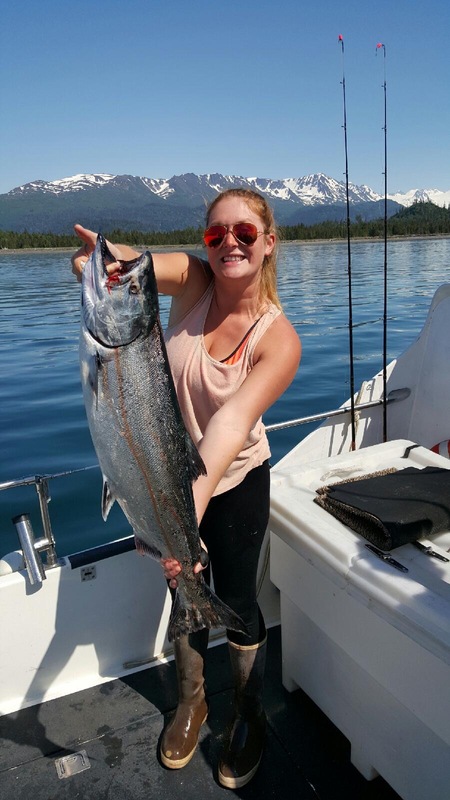 For more information about our Homer, Alaska, fishing charters, call us today at (907) 299-5911, email us at info@alaskasaltwateradventures.com or contact us here! Homer, AK Area 3A (Central Gulf of Alaska): Charter Anglers will have a two halibut daily bag limit, one halibut being 28’’ or less. Wednesdays will be closed to Halibut charter fishing in 3A all season, Also Tuesdays from July 16th to Aug. 13th. There is a 4 halibut annual limit for guided sport caught halibut. Wednesdays are a great day to Salmon fish.